BA.LLB (Hons) (W.Aust); Ph.D. (ANU); MHEd (ANU); Barrister & Solicitor WA. Professor Anthony Connolly holds an Honours degree in law from the University of Western Australia, a Masters degree in education from the Australian National University, and a Ph.D. in philosophy, supervised by Professors Philip Pettit (Princeton) and Robert Goodin (ANU). He specialises in legal philosophy, Indigenous rights law, and public law. Professor Connolly is the author of Cultural Difference on Trial: The Nature and Limits of Judicial Understanding (Routledge: 2010) and The Foundations of Australian Public Law: State, Power, Accountability (Cambridge University Press: 2017). He is the editor of Indigenous Rights (Routledge: 2009), Public Law in the Age of Statutes (with D. Stewart) (Federation Press: 2015), and Cultural Heritage Rights (Routledge: 2015). In addition, he has published a number of book chapters and journal articles on legal philosophy, indigenous rights, and public law. Within his main area of legal philosophy, topics which presently interest him include the legal regulation of cognition and communication; legal modes of intercultural recognition; judicial concept acquisition; the theoretical status of analytic jurisprudence; the naturalising of jurisprudence; and the role of legal philosophy in legal education. In addition to his substantive research areas, Professor Connolly also maintains an interest in the theory and practice of legal education and academic governance, publishing on these topics and leading a number of important educational reform initiatives within the Law School. 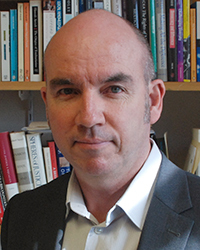 Since 2014, Professor Connolly has been the Editor-in-Chief of Australia's leading journal on federal law and federalism, the Federal Law Review. He is presently working on two book projects relating to law and reconciliation and to global Indigenous rights. The Foundations of Australian Public Law: State, Power, Accountability (Cambridge University Press: 2017). Cultural Difference on Trial: The Nature and Limits of Judicial Understanding (Routledge: 2010). Cultural Heritage Rights (ed.) (Routledge: 2015). Public Law in the Age of Statutes (ed. w D. Stewart) (Federation Press: 2015). Indigenous Rights (ed.) (Routledge: 2009). 'Legal Pluralism and the Interpretive Limits of Law' in Culture in the Domains of Law, R. Provost (ed. ), (Cambridge University Press: 2017). 'Cultural Heritage Rights: Conceptual, Legal and Political Foundations' in Cultural Heritage Rights (Routledge: 2015). 'Judicial Concept Acquisition: An Analytic Framework', 3 University College London Journal of Law and Jurisprudence (2014) pp.1-29. The criminal trial of a senior Thai academic along with four others that commenced this July 2018 has thrown a sharp spotlight on conditions in Thailand’s universities since the military seized government there in 2014. He is presently working on a book project relating to global Indigenous rights. Australian Learning and Teaching Council Priority Project Grant 'Internationalising the Australian law curriculum for enhanced global legal education and practice' ($135,000) with collaborators from University of Sydney and Curtin University (2010). Cultural Difference on Trial: The Nature and Limits of Judicial Power (Routledge: 2010). ‘Legal Pluralism and the Interpretive Limits of Law’ in Culture in the Domains of Law, R. Provost (ed. ), Cambridge University Press: Cambridge, (forthcoming 2017). ‘Public Law and a Public Lawyer in the Age of Statutes’, in Public Law in the Age of Statutes: Essays in Honour of Dennis Pearce, Federation Press: Sydney, (2015) (with Daniel Stewart). ‘Cultural Heritage Rights: Conceptual, Legal, and Political Foundations’, in Cultural Heritage Rights, Ashgate Publishing: Farnham (International Library of Essays on Rights Series), (2015). ‘The Challenge of the How: Developing a Process for Legal Education Program Renewal’, (with Molly Townes O’Brien) in The First Year Experience in Law School: A New Beginning?, L.Wolff and M. Nicolae (eds. ), Halstead Press: Sydney (2014) pp.117-29. ‘Introduction’ in Indigenous Rights, (ed. ), Ashgate Publishing: Farnham, (2009), pp.xi-xxxv. ‘Conceiving of Tradition: Dynamics of Judicial Interpretation and Explanation in Native Title Law’, in Interpreting Statutes, S. Corcoran and S. Bottomley (eds. ), Federation Press: Sydney (2005) pp.118-146. ‘Legal Facts and Humanist Stories: The humanist as expert witness’ in Proof and Truth: the Humanist as Expert, I. McCalman and A. McGrath eds., Australian Academy of the Humanities: Canberra, (2003), pp.135-144. 'Judicial Concept Acquisition: An Analytic Framework' 3 University College London Journal of Law and Jurisprudence (2014) pp.1-19. The Boundaries of Difference in Law: A Critique of Radical Incommensurability, 25th IVR World Congress: Law, Science, and Technology Paper Series, Goethe Universitat, Frankfurt am Main (2012). Available at http://publikationen.ub.uni-frankfurt.de/frontdoor/index/index/docId/24924. ‘Legal Positivism and Personality’, 28 Australian Journal of Legal Philosophy (2003), pp.192-8. ‘On the Limits of Cultural Difference at Law: A Philosophical Rethinking of the Metaphysics’, 1 Inter-Cultural Studies (2001), pp 28-39.